Bumping to add a second, really excellent article on littermate syndrome. Upon reading Patricia Leslie’s email, I knew I’d be replying with disappointing news. “We were planning to adopt one puppy, but the breeder said that raising two sisters would be easier.” Leslie had contacted me after reading my blog post about littermate syndrome, in which profoundly bonded siblings have difficulty relating to humans and other dogs. “After we brought the mixed-breed girls home at nine weeks, their behavior grew completely out of control. My husband and I could not get their attention for more than a second or two, as if we weren’t even in the same room. And then they started displaying alarming fearfulness of people and other dogs.” I made an appointment to meet Patricia, her husband Karl and the puppies the next day at their Richmond, California home. Many dog behaviorists, trainers, breeders and shelters discourage adopting siblings. Anecdotal evidence suggests that behavioral issues may arise during key development periods because the two puppies’ deep bond impedes their ability to absorb and grasp the nuances of human and canine communication. Since fear is the default reaction to odd or unfamiliar stimuli in dogs, this muddled understanding of the world around them can lead to impaired coping mechanisms later on. Many factors influence behavior and not all siblings raised together will exhibit signs: Littermate syndrome is a risk, not a foregone conclusion. During my appointment with Leslie, we determined that the best course was to re-home one of her twelve-week-old siblings. Dunbar agrees that it’s often best to separate littermates, especially if symptoms appear early, so that each has a chance to develop normally as an individual. This is obviously a burdensome decision for the overwhelmed owner to make, a sort of canine Sophie’s Choice, so he recommends that the new owner meet both puppies and determine which to take home. Owners committed to raising a pair should ensure the puppies spend significant portions of every day apart so that each learns how to be alone—a key lesson in any well thought-out puppy program. This means feeding, walking and training separately, with individual crates in different parts of the home. Even trips to puppy socials and the vet should be separate so that both learn to incorporate these episodes into their psyches without being overly dependent on their littermate. Dunbar, too, is adamant that a key lesson for a puppy to master is how to be content with being alone, all but impossible with two siblings. “Once we’ve done that, yes, he can live with other dogs and have free run of the house. But if you don’t teach puppies early on how to be alone, and especially with siblings who have always been together, it will be catastrophic when one dies.” Dunbar encourages multiple dog households—“I always like having three dogs”—but the timing, temperament and age that each enters the home is paramount. While the majority of comments to my blog corroborate struggles in raising siblings—including the ongoing aggression and fighting often seen between same-gendered littermates—others write of well-adjusted cohabitating pairs. A common thread seems to be that littermates are more likely to thrive when introduced into a household with an older dog, who perhaps acts as an arbiter and stabilizing influence. Myriad factors affect dog behavior, including genetics, early life experiences and owner engagement. As University of California/Davis veterinary behaviorist Dr. Melissa Bain points out, “two fearful littermates very well may be genetically predisposed to fear.” Bain is less inclined to apply the term syndrome to the set of symptoms: “It makes you think all littermates have problems, which is not the case.” She also emphasizes that the level of owner involvement is key, saying “the symptoms escalate when the owners treat them as one dog with eight legs.” When conflict ensues within the pair, Bain believes it’s due to the dogs being too similar in size, age and gender. “This uniformity makes it difficult for the siblings to delineate a hierarchy,” she said. While siblings blessed with extraordinary genes and socialization-forward owners may deflect littermate syndrome, the consensus among canine professionals is that it’s not worth the risk. Most would encourage new owners to adopt a single puppy that suits their lifestyle and to focus on the training and socialization that strengthens the interspecies bond unique to humans and dogs. Once your puppy is a dog, by all means, get a second since the two will be at completely different stages, and the older one may very well emerge as a great life teacher to the younger. I found this article very interesting and have always felt it was a bad idea to get ilttermates and/or two pups at the same time. I am curious though how breeders handle keeping two or more littermates at a time to select a puppy for their own since a lot of breeders will do this to "grow a puppy out" before placing them. I was so excited to be getting my Dobies that I did research on the breed, and not research on whether getting two at a time would be a good idea. I have two eight week old puppies, one boy (Ares) and one girl (Athena). I am noticing that they seem to be better individually with me than while they are together. Is it hopeless that they will be able to grow up and be functioning, coexisting members of my family. I have clearly become attached to them in the short time I've had them and I don't really want to have to let one go. Any ideas? Also a quick question...I'm scared to take them outside for walks as I live around many other dogs and I don't want my dogs to get sick; they haven't finished their vaccinations yet. Is it safe for me to walk them or am I stuck potty pad training for the next two months? Any one in the metro Atlanta area? I personally wouldn't want to try it. It can be done with a lot of skill, time, and effort. This sheds a bunch of light to me. I just recently got my Dobie from a couple who had brought home my pup (Faust) and his brother home at the same time, Now Faust has severe social anxiety, I have to take him out everyday just so he won't be so scared of people and other dogs, Him and his brother were fighting a lot from what I was told and the coupld just couldn't the both of them so they gave him to me. You need to working with either an excellent trainer and/or a certified behaviorist. Littermate syndrome often causes problems that last a lifetime for a dog unless some extensive training is done and that training needs to be structured by a very knowledgeable person. Very few pet owners are able to figure out the plan for training that will help the dog overcome all the issues. My good friend who is an excellent trainer is currently working individually with two mastiffs who were sold to the same owner and now both dogs have extensive issues caused by littermate syndrome. They are only 16 weeks old but the psychological issues are very large and sound exactly like what you are dealing with. You are not going to find solutions online I'm afraid. However you might find a referral to an excellent animal behaviorist if you post your location. This one actually contains a comment in line with one of the points I wanted to make, too. Interesting theory. But I think it's mostly opinion IMHO. We had two Labs (litter mates) that lived long healthy lives; they always would prefer to sit and snuggle with family and people than each other. Although they slept, ate, played, walked, pooped with each other for nearly 15 years together. I never noticed any of the symptoms the OP noted. Honestly, I doubt it's much of a challenge raising littermates from breeds with naturally lower drive and naturally dull temperament like many "pet-grade" "family dogs", which is what I'd generally consider most Labs & other retrievers. I mean, if there's not much there to amplify to begin with, then there's not going to be much more to cope with even after it's been amplified by riffing off a littermate. 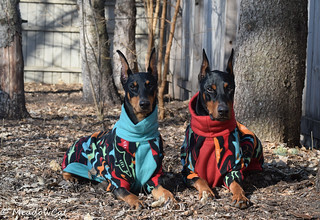 A low drive and dull temperament is not correct for Dobermans, which is why it's generally a good idea to avoid setting-up a situation where drive could be amplified & channeled into severe, debilitating neurosis. But that aside, there are just some topics which require the application of simple logic. It kind of bugs me that we have so many folks comparing apples to oranges (or Labs to Dobermans!) or belaboring the notion that one success implies that everyone should be successful, with the accompanying extension that (a) those who fail are incompetent or (b) there's a conspiracy afoot to convince everyone they're likely to fail to prevent them from trying in the first place. Just because I seem to do well with Dobermans doesn't mean I'd trust most dog owners, let alone just any dog owner, to also do well with Dobermans. Just because an experienced dog owner might enjoy the challenge of a dog with a strong temperament and high drive (such as a Doberman), that doesn't mean that a novice dog owner can handle the challenge. Just because I have done well with the two Dobermans I've had, doesn't mean I'd do well with just any Dobe out there. Just because someone bought a dog from a BYB or a particular breeder and had no problems with their specific dog does not imply that all BYB dogs are worry-free, nor that someone who claims to have had a bad experience with a dog from a particular breeder is lying, stupid, or incompetent. If I acquired littermates and did alright raising them, that doesn't necessarily mean that anyone could do it, or even that I could handle any pair of littermates out there. That's today's lesson in applying logical conclusions. Throwing one or more of the alternate, irrational conclusions to the above together compounds the challenges and increases the likelihood of disaster, which is why good breeders tend to balk at any one of the higher-risk circumstances and try to avoid setting buyers up for heartache and dogs being dumped on rescues. If the goal is placing pups in First-Forever homes, some situations just aren't appropriate risks. Personally, I have other reasons for not accepting the Dobe littermate challenge. I really prefer some age separation for the sake of overlap, few things are more soul-crushing than struggling with end-of-life issues in two animals at once, and losing them in rapid succession. Last edited by kaloric; 09-04-2014 at 02:09 PM. I just saw this today -- this is fascinating. When my boy was 1 year old, we moved into a mother-in-law suite and began sharing a yard with a couple who had a 1-year-old female Lab. The dogs bonded immediately and became great friends. Silas and I always did our training in our own apartment but, because the dogs enjoyed each other so much, I would frequently walk them together and let them play together in the yard. Now, 1.5 years later, the Lab gets severe separation anxiety if she isn't allowed to see my dog at least once each day. She also tends to bully him in their play (she doesn't like to share toys) and it's difficult to get her attention. She's become resistant to training since we've lived there. My dog, on the other hand, has become more shy. He started out as a very bold, confident puppy but now I would describe him as a bit insecure. I think it's fascinating to see the effects co-habitation has had on our dogs, considering they don't actually LIVE together, and they didn't meet until they were both 1 year old. I can easily see how trying to raise to puppies in the same household would be absolute mayhem and incredibly detrimental to the dogs' development. We are currently living this bad scenario. We have two 4 month old female littermates. Miss Scarlett is definitely dominate over her sister Sage (hence the name Miss Scarlett). They have been with us just over a week and we are drowning in behavioral issues. Deciding whether to bring a trainer into the house or go with Petsmart training. Any advice is welcome. I suppose we are also deciding whether to keep them together or find a new home for one as heartbreaking as it may be. Welcome. If you've only had them a week I would try to find another home for one. I know that's not what you want to hear but I think that's what would be best. Not only do you have littermates you also have 2 females which isn't an ideal situation either with a breed known for SSA. SHAME ON YOUR BREEDER!!!! I would recommend seeking out a training facility and petsmart/petco... isn't one that I would recommend. Not sure where you are located but possibly try reaching out to your local dpca (Doberman pinschers club of America) and see if they have some facility recommendations. Best of luck to you. Maybe you could start a thread, introduce yourself, show some pix, tell your story...? If you have only had them a week I would strongly recommend you consider returning one to the breeder/rescue. If you are already "drowning" in behavioral issues it is only going to be a rough road ahead. It will really be the best option for both pups to separate them now. Came across another fantastic article on littermate syndrome to add to our sticky. Original is here: https://blog.betternaturedogtraining...5y5xocipQ5dScM. Credit: By Jeff Stallings, CPDT-KA. Copied below for convenience. 04-23-2019 10:12 PM by alan j.